The new one from Bleached dropped today. This is a good thing and I say that as someone who came a bit late to this party. In fact, it was Dan Searing (The Saturday People, Glo-Worm) who raved about the band years ago when I was chatting with him at a Lorelei/Babies show in D.C. He was right: this is mighty good music and Bleached have found a way to make big tunes with the tools of indie. And the cuts on Welcome The Worms, out today on Dead Oceans, are more of that sort of stuff. If "Keep On Keepin' On" and "Sleepwalking" are all big Jesus and Mary Chain hooks with a pop sheen, then "Sleepwalking" is some admirable attempt to channel both The Slits and The Shaggs in a more serviceable fashion. The catchy "Wasted On You" is as smooth as an early Go-Go's cut and as sharp as a Stooges single. Balancing the needs of indie and pop, Bleached make music of a sort that is in short supply these days. Using an approach not unlike that of The Primitives (though of a decidedly harder edge), Bleached update Sixties styles with an Eighties sense of production. This is superb alt-rock that recalls bands as diverse as Belly and L7 and is every bit as accessible. Bleached -- Jennier and Jessie Clavin and Micayla Grace -- crank up an impressive racket on Welcome The Worms and it's one that is largely melodic and bright. That said, the band venture into new territory on the near-shoegaze, near-grunge explorations of "Desolate Town" and "I'm All Over The Place (Mystic Mama)", for example. Those two cuts hint at a more experimental side to Bleached and offer up proof that the band is comfortable outside of riding maximum Ramones riffs to the other side of glory. Welcome The Worms by Bleached is out today via Dead Oceans. 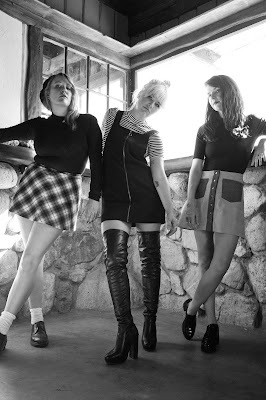 You can find out more about Bleached via the band's official website. New Music From Close Lobsters Is Here! Play New Moles (Richard Davies) Track Here!